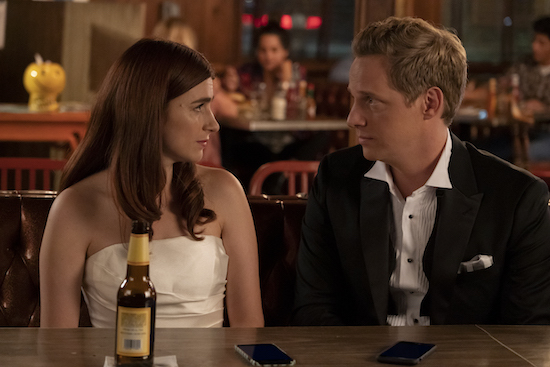 YOU’RE THE WORST ended its five season run with a fittingly unconventional ending: Jimmy (Chris Geere) and Gretchen (Aya Cash) ran out on their wedding, and opted to just commit to each other anew every day. For the duo, it worked. The flashforwards—which had been teased throughout the season—showed the couple was still together, and raising their daughter. The friend group did grow apart, however, as Edgar’s (Desmin Borges) warning that Jimmy shouldn’t marry Gretchen shifted their friendship and allowed the scribe to move to New York. He reunited with his estranged friend in the future at Lindsay (Kether Donohue) and Paul’s (Allan McLeod) second wedding, and the two were (mostly) able to put things behind them.